Our catalogue lists published company histories, unpublished company papers, annual reports, newsletters, official company web sites and blogs. 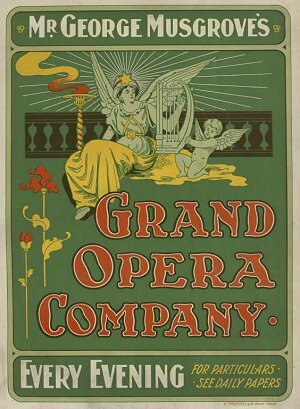 If you are interested in looking at material from the Theatre Programme Collection, start by searching the catalogue using main words from the name of the company. For example, type in red stitch or chamber made opera. Add the words, theatre programme, to the catalogue search box with main words from the name of the company. Material is catalogued at file level rather than item level. This means that when you request a file you may find it contains annual programmes and publicity material covering the company's activities over a number of years. Request files at the Information Centre desk or phone 03) 8664 7009. Files are delivered to our Heritage Collections Reading Room. Delivery time is 20-30 minutes and you must order before 5.30 pm. You will not find every company represented in our collection named in our catalogue records so you may need to do some research first. Newspaper reports and reviews of performances will often include the name of the company. You can then check the catalogue for those performance titles. Newspapers are a very useful source of information. They may contain articles, interviews, photographs, reviews and advertisements for companies. Our research guides, How to find newspapers and How to find items in newspapers, will help you navigate our large collection. The guides cover both historical and current newspapers. Daily newspapers such as the Melbourne-based, The Argus, The Age, The Sun and The Herald all carried theatrical information. You should also check local suburban and rural newspapers for local and amateur companies. AusStage is a directory of Australian performing arts. It is not exhaustive but it can help you to find out where a company was performing in a given year. If there is more than one word in the name of the company try searching by exact phrase, for example, bangarra dance theatre. You can also find company information on Trove. This is the search engine managed by the National Library of Australia, with access to collections across the entire country. Many companies will have their own web sites which include historical and contemporary information about the company. In a search engine such as Google or Bing look for companies like Malvern Theatre Company, Lucy Guerin Inc., Latrobe Theatre Company and Circus Oz.